Gurnee Garage Doors, Gurnee Garage Door Repair | Overhead Garage Door, Inc. Overhead Garage Door provides local service to Gurnee and surrounding communities. Our experienced team of technicians are available to repair or install a new garage door anywhere in Lake County. Overhead Garage Door has over 35 years of experience. We’re an Angie’s List Super Service Award Winner, an A+ rated business with the Better Business Bureau and a Houzz Garage Door Repair Pro. Overhead Garage Door is a member of numerous industry organizations including the International Door Association and Central States Door Dealers Association. We are proudly family-owned and operated. Overhead Garage Door is the highest rated, most awarded garage door company serving Gurnee. Schedule service today! When you are selecting a garage door company, it’s important to do your homework. Overhead Garage Door works hard to maintain numerous certifications and accreditations. We have over 350 reviews on Angie’s List and an overall rating of A+. Unfortunately, unscrupulous tactics are used by numerous competitors that portray themselves as garage door companies, but in reality they lack very basic licenses and insurance policies. These companies may offer lower prices upfront, but in reality there are little if any protections for the consumer. Many of these scam businesses pretend to be located in Gurnee or Lake County. Be careful when researching online or in the phone book to select a company that is licensed, bonded and insured. The Better Business Bureau made a series of recommendations for selecting a garage door company. Follow these steps to evaluate the company you choose or take out the guess work and call Overhead Garage Door today! “I’m usually a do-it-yourselfer but when it comes to garage doors, I don’t have a clue. From the moment Bob B. showed up at our house, I was grateful that I called Overhead Garage Door, Inc. Bob’s work was worth every penny.” – Kevin M.
“Paul R. made sure we got the highest quality garage door at a great price.” – Kelly S.
“Carrie B. was so polite and professional. Her helpfulness is much appreciated.” – Mike S.
We aim to please with each and every installation we tackle for the residents of Gurnee. Garage door repair and installation is our specialty, and we put our customers’ needs first. One of the best reasons to depend on Overhead Garage Door to repair your garage door is our quick response time. We’re real people and we understand what it means to have a broken garage door jeopardizing your family’s welfare. You want to keep the cold weather out and your household safe inside. That’s why we are on call 24/7 – with emergency garage door repair service available in Gurnee. Our knowledgeable experts take your call. We respond immediately to inspect your damage. We write up a free quote for your garage door repair or installation. You can look over your quote, and we can get started. It’s a very simple process, and we take out the stress by coming right to your home in Gurnee. Find the solution to your broken garage door. 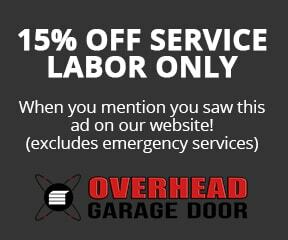 Choose Overhead Garage Door serving Gurnee and all of Lake County for over 30 years. Our garage door repair services are unparalleled in Gurnee. It doesn’t matter what materials your garage door is made of – our trained experts know just what to do. Call us today and get the finest garage door repair services in Gurnee. Experience high-quality products at cost-effective prices.